When considering options for painting, you may end up with even more questions. If you had been undecided about the level of your res­toration, perhaps waffling between an upper-end, driver-quality car and a true concours-level effort, choosing the paint and exterior finishing will likely help sort that out. As with just about everything else, it depends on your plans for the car and how much you can budget for that portion of the restoration. There is a huge difference between a driver-level paint job and a points-judged effort. That is not to say that the paint for a driver is necessarily inferior from a materials or durability standpoint, but there is a much higher level of preparation when going for gold awards. This ultimately drives up the cost to where the final finishing ends up being the largest part of the restoration bud­get even more than the drivetrain rebuild, or the suspension prepara­tions, or the interior refurbishing. It’s been said before, but it needs to be said again, painting a car is an art and a science. It takes the right materials, correct techniques, and some experience to achieve pro­fessional results. 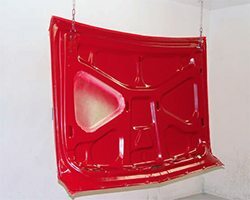 It also requires a commercial paint booth and an assortment of professional equip­ment. A commercial paint booth can cost $10,000 or more and is the size of a typical garage stall or larger. So this isn’t equipment an at-home restorer is typically going to buy. In addition, in some states, it’s illegal to paint a car at home. For most paint types (enamel, lacquer, polyurethane), the materials are hazardous and expensive. A gal­lon of urethane paint (the most com­monly used today) often retails for $130 to $200, so this is a significant investment. Keep in mind you need to invest in primer, base coat, and clear for most multi-stage paint sys­tems. In addition, a large amount of preparation work is required for a quality outcome, but it also takes the mastery of several different opera­tions, all of which are essential to a high-quality result. A quality out­come also revolves around where this operation is going to be performed. Will it be a high-tech paint booth with state-of-the-art temperature and humidity control, filters for dust and overspray or a damp, dusty, cement-floor garage? The advantages of a professional spray booth cannot be overstressed because if it is correctly prepared and operated it provides the optimal environment for painting. 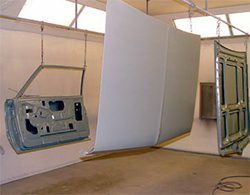 A booth offers temperature and humidity control, keeps contaminants away from the surface to be painted, and controls overspray. While you can build a temporary paint booth to paint your car at home, the process takes a lot of time, preparation, and work. Even a temporary paint booth doesn’t control contaminants as well as a professional one. If dust is present, it will show up in the paint and produce flaws that must be fixed. The dust factor alone should be enough to send your car to a professional body shop. As mentioned, the main differ­ence is in the preparation. The con­cours-level paint, the type that earns the gold awards will have the ben­efit of perfectly straight, wave-free bodywork under multiple, expertly laid coats of primer, block-sanded to perfection. On top of that are several coats of color, each laboriously hand-sanded, and then the clear coats, again each hand-sanded. The top coat is sanded, buffed, and waxed to a point that the finish looks as if it is 6 feet deep. This level of preparation is what it takes to get the top honors. On the flip side, having a finish this perfect will most likely render the car a trailer queen or it is likely that the owner is a nervous wreck every time the car goes out into traf­fic. The type of car that you see at a cruise night, does not have particular use for a finish like this, and it is not necessarily desirable to have paint this perfect. The cost differential is also enough to keep most restorers from putting that much money into a street-driven vehicle. If you cannot relax enough with your car to drive it around, it’s not really a driver any­more and the fun factor goes out the window if being able to drive it is your primary objective. A driver-quality paint job is something closer to what you have with a new car. From 10 feet away, it is virtually indistinguishable from a full-tilt show car and looks fantastic on the road or at a cruise night. It has plenty of shine and is very dura­ble. The Woodward Dream Cruise is full of cars that fit this category. The truth is, a good, driver-quality paint job is 90 percent or more of what a show-car finish is and will likely be enough to get you first-place trophies in local shows but will not quite be enough to impress concours judges. In order to save time and money, you can cut some corners with a driver-quality paint job. Not every coat of primer is going to be hand-sanded to perfection. Additionally, you may be able to get acceptable results with a single-color stage, rather than multiple coats. 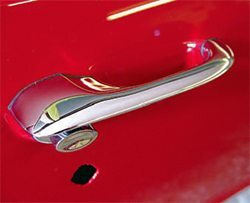 If the color is non-metallic, you may even be able to skip the clear coat alto­gether, if the paint is formulated for that. There are a lot of options here, and your body shop should have very attractive alternatives if you’re on a tight budget. Every car and budget are different, and some consulting on that topic with your shop manager will help you find the right paint and prep level for your situation. There are many very good-quality paint systems. I use the term “paint system” because manufacturers of modern paints produce and market their paint lines to coincide with every step of the painting process, including primers, color coats, top coats, even thinners, flex agents, and catalysts. It actually makes sense to work with one line of paint products from one brand. The reason is that they are engineered to work together and provide the best overall perfor­mance, in terms of application, dura­bility, and appearance. You might be able to get by with a primer from one, color coat from another, and clear from a third, but why? There is risk to that approach with no real benefit. 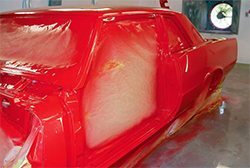 Before you get to the primer stage, consult with your body shop to choose a paint system that is right for you and your GTO. Most body shops have a brand that they work with. This brand often has certain qualities that are the best fit for their facility and their technicians. Maybe it is nothing more than there is a good sales rep for that brand in the area. The truth is, all manufacturers make high-quality paint systems, and most of them market low-cost “used car lot” lines as well. Researching the options Online and consulting with your body shop manager will help you narrow your choices. Right now, the current trend is to work with catalyzed base-coat/ clear-coat systems. They offer a great combination of ease of application, coverage, shine, and durability with minimal maintenance. Though they are enamels, they can be color sanded, as the catalyst hardens the entire thickness of the paint, not just the surface as with conventional enamels of the past. 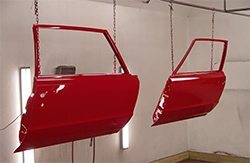 Additionally, this new genera­tion of paint systems is far superior to the original “magic mirror” lac­quer finishes applied to GTOs from the factory. Manufacturers such as DuPont, PPG, Sikkens, Sherwin-Wil­liams, House of Kolor, and countless others market these systems with excellent results. Again, consult with your body shop for the best selection of the paint for your application and price range. I am going to be upfront with you on this subject. Unless you have access to a shop with a modern paint booth, compressor, spray guns, proper respirators, and full-body overalls, and you have a good deal of experience with this equipment, you should have a professional do the work. It is as simple as that. There are many factors to take into account, including your experience level (or lack thereof), the type of facility you will be using, local zoning regula­tions, and most important, safety. Personally, I wouldn’t even con­sider painting a car myself. I realize that it’s far out of my skill set and I don’t have the time or inclina­tion to learn the proper procedures. While I can handle a spray bomb, that doesn’t qualify me for the job. I know enough about painting, and myself, to hand that part of the resto­ration over to someone more skilled and experienced. There is also another factor to consider. Here in New York State, where I live, the huge level of zon­ing regulation has really precluded the home builder from painting their own vehicles. This trend is spread­ing across the country. Safety is the main reason for this sort of regula­tion, though it is certainly not the only reason. How many times has neighboring property been damaged because of unskilled painters allow­ing overspray to travel even blocks away? How many times has some­one become sick from fumes? The answer is enough times for people to demand regulation. Wear a full-face respirator. Sup­plied air (outside air) respirators are preferred. Use a downdraft-type paint booth. I am not trying to make it look like some sort of nightmare scenario will inevitably happen if you try painting yourself, but it’s likely that unanticipated problems will arise once you get started and by that time, it is often too late. Also, time is money, and nowhere will it be more evident than if you try to paint your car at home, mess it up, and then take it to a professional shop to fix it. The fix often involves a strip down to the bare metal, negating all of the time and money you spent on your do-it-yourself attempt. In this scenario, the cost is signif­icantly higher than having just sent them the car in the first place. If you aren’t experienced and 100 percent sure you can do this, save yourself the mental trauma and a good deal of cash and let a pro do it. When it comes time to select the proper people to paint your car, cost is not the most important fac­tor but it is fairly high on the list after all, you are footing the bill. You obviously want the best work avail­able for the amount of money you have budgeted. In addition to cost, you should look for quality of work, positive word of mouth, and repeat customers. 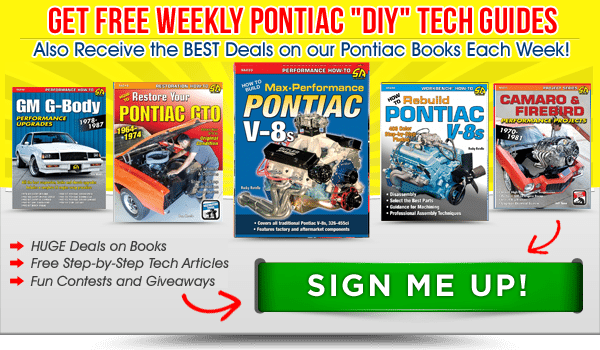 You can start by logging onto the many Pontiac and GTO message boards, such as the Performance Years Tech Forums, the POCI Mes­sage Board, and other such meeting areas for Pontiac GTO fans. Starting a topic thread such as, “Looking for a reliable body shop in Toledo,” or wherever you live, will no doubt get a variety of opinions. You may have to sift through some obviously unqualified opinions, but it will help point you in the right direction and give you a few leads you didn’t have before. This is an area where belong­ing to a club, such as POCI, Antique Automobile Club of America (AACA), or GTOAA, benefits you. 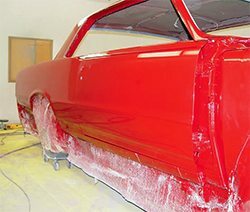 By joining a national club and its local chapter, you put yourself in front of fellow GTO fans in your area whose prior experience greatly aids you in the proper selection of a body shop to paint your car. This is a benefit that will pay huge ben­efits, much more than the cost of the membership fees. You can learn who the members have used in the past, who they have avoided, and who have earned their repeat busi­ness. Best of all, you can actually look at your fellow members’ cars and see who got the best result for their money. With all of those cautions, it doesn’t mean there is nothing for you to do in the area of paint prepa­ration. If you’re planning to restore only one car, investing in paint guns, blocks, sanding materials, and other equipment is probably not worth it. Let’s face it prepping, painting, and blocking a car is an art. While savvy and skilled novices can perform a commendable job, your first paint job will not be as good as the work of a qualified professional. On the other hand, if this project is the first in many restoration proj­ects, it makes sense to invest in the equipment and develop the skill to paint a car. 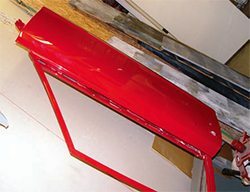 A temporary paint booth can be created in your garage and you can obtain good results, but it takes time, dedication, and patience. If you choose to have someone spray your car, you can perform a lot of the prep work yourself. Best of all, because the prep work is typically the most expensive por­tion of the labor costs involved with a paint job, you can actually do the majority of it yourself and if done correctly, you can save a bundle of money. 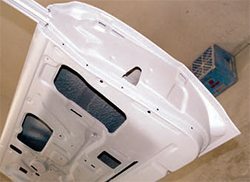 Ideally, if you are able to do the majority of surface prepping, you should be able to afford a higher-quality paint job than if you sent the car without any prepping. This is also more in the spirit of the do-it-your­self mindset of most hobbyists. Once the bodywork is near com­pletion, the focus shifts from welding and panel replacement to making the surface as perfect as possible. This is long and tedious work, but it pays dividends, both in the quality of the finished product and the reduced labor costs to you. Contrary to popular belief, at least in my neck of the woods, qual­ity body repairs are not made solely out of body filler. Quarter panels are not to be replicated out of Bondo. 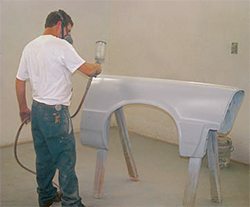 As a result, body fillers have a somewhat shady reputation in some parts of the country, but the truth is that they are necessary for a high-quality paint surface. In fact, filler is even used at the factory. 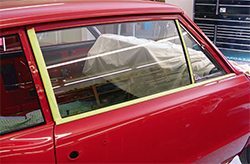 In the old days, roof-to-quarter-panel seams were filled with lead and other imperfections were similarly treated. 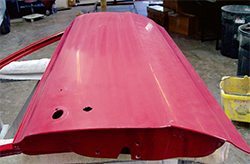 When the paint is stripped off your GTO (if it hasn’t been subjected to major bodywork in the past), you will most likely find some lead filler from the factory. 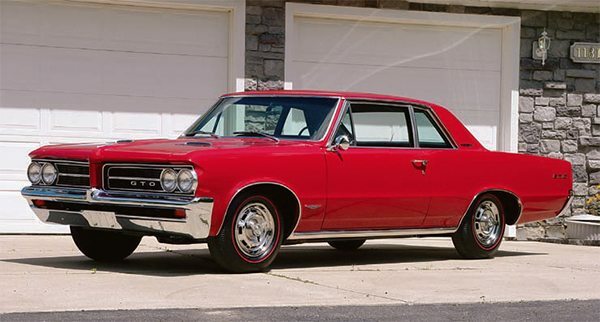 Even during the GTO’s initial assem­bly, it was not usually possible to get the high-quality body seams without some sort of filler. It is still true today with new cars. Unlike the Bondo abusers of the Northeast, filler should be applied to panels so it is not more than 3/16 inch thick when completely sanded. If you have spots more than 3/16- inch lower or higher than the rest of the surface, more bodywork is nec­essary, which may require grinding, hammering, or welding. Once those are made as close to the surrounding bodywork as possible, filling is then an appropriate solution, not before. These days, the quality of plas­tic fillers has progressed to a point where the use of old-style lead fill­ers is completely obsolete. There is no longer any justification for the use of lead, as it is toxic, expensive, and requires special ladles and panel-distorting heat to use. It also takes quite a lot of experience to apply and work with it correctly. Lead filler has gone the way of the buggy whip and Betamax VCR. Avoid the temptation. 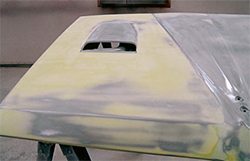 In the quarter-panel patch replacement procedure outlined in Chapter 3, I actually used two dif­ferent types of plastic body filler a standard “lightweight” version used for the top surface under the primer and all-metal, a stronger version that contained powdered aluminum. For the patch, I used the real metal filler to seal and waterproof the welded areas. The reason it wasn’t used as the top surface for the primer to adhere to was because it does not sand out as smoothly as the light­weight filler. The proper use and handling of plastic filler is fairly simple, but it can be a harsh irritant if it or the chemical catalyst comes into con­tact with your skin. Wear rubber or plastic gloves and avoid breathing the fumes. Also make sure that the area to be filled is completely free of paint, oil, grease, or other con­taminants, as they do not allow the filler to properly adhere to the parent metal. If the area is relatively small, make sure there is a border of bare metal at least 1 inch all around the area being worked on. This helps to properly shape the fill and avoids contamination. Whatever the size of the area to be filled, the metal should be prepped with 40-grit sandpaper to ensure that the metal is rough enough for filler to adhere to it. After familiarizing yourself with the proper ratios of filler and cata­lyst (as outlined in the manufac­turer directions) use a plastic putty spreader to mix the two to achieve a completely homogenous color. (The catalyst is dyed so you know when the two are uniformly mixed.) The more catalyst you use, the faster it sets up, so make sure you give your­self enough time to properly apply it to the body surface to be filled. Use a flexible plastic putty spreader to apply the filler, using enough pressure to push the filler into crevices around welds, low spots, etc. The pressure also helps reduce the chance of excessive filler being applied that has to be sanded off any­way. Use smooth, broad strokes and use the spreader to wipe away excess filler before it sets up. Depending on the brand of filler you use and the amount of catalyst folded into the mix, you have about 20 minutes to perform the job. Once the filler has hardened and covered the desired area in roughly the correct contour, block sanding can begin. This procedure is pretty simple, but rather tedious. 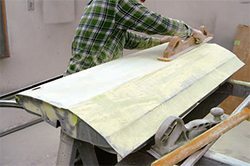 After finding a sanding block specifically designed for the purpose and the right size for the job, start with a fairly rough grade of paper 40- to 60-grit sandpaper knocks down high spots in the filler and gets the gen­eral contour into shape. A long, rigid sanding block works well for doors, and a flexible unit is appropriate for contoured areas. The more pro­nounced the contour, the smaller the block should be. The block-sanding procedure can be sped up significantly with the use of an orbital sander, particularly in the early stages when knocking down excess filler is needed and the final contour is still a few steps away. Keep in mind, however, the speed in which an orbital sander operates could cause too much filler to be removed, necessitating a redo. Use a mask to avoid inhaling the plastic filler dust. Periodically check on your prog­ress, especially with the rough sand­paper you don’t want to go too far with it. Using a spray can of dark primer as a spot coat or a primer spe­cifically made for the job, spray the area with a light coat and allow it to dry. From there, closely inspect the panel for high and low spots as well as the correct contour. Once you have gone as far as you can with the rough-grit paper, you can then proceed with 180-grit sand­paper. The idea at this stage is to make the surface as perfect as possible, save for the inevitable sanding scratches. Mark high and low spots and use spot putty to fill the low spots, if they are less than approximately 1/16 inch deep. Spot putty is the consistency of toothpaste and is essentially the same chemical compound as found in primer paint, but it is quite a bit thicker. It fills sanding scratches and other minor imperfections. Anything deeper than that should have con­ventional filler applied. Once the panel has been inspected and any problems cor­rected, you can move on to 320-grit sandpaper. It is helpful to use wet/ dry sandpaper. Use a spray bottle with water to help keep the sand­paper from getting clogged up with filler. Keep sanding and spot coat­ing until all imperfections are gone, right down to the sanding scratches. Since the paint needs something to adhere to, don’t go smoother than 320-grit. The enemy of any paint job is con­tamination. Dust, dirt, or any debris is often the culprit of a ruined or poor paint job. In turn, the cleaner the painting environment, the cleaner the paint job will be. If you’re going to paint at home, you must construct a temporary paint booth and keep it as clean as possible close to “operating room clean” is ideal. 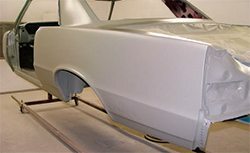 Once body filler has been applied, shaped, and sanded you need to prep the entire area to be painted. Therefore, you need to wash the area with a silicone-free sol­vent so the parts are clean. Clean the panel all the way out to edges and the borders of the masking tape. You can use a wool pad or Scotchbrite pad to clean and rough up the surface for excellent paint bonding. The actual procedure is not com­plicated, yet takes many hours to per­form. It certainly isn’t easy work, but some real effort here can pay big divi­dends in the quality of the finished product. You will also save money by doing this yourself. I know of one show-winning Pontiac where the owner spent six weeks block-sanding just the rear quarter panels. The car was black and it was intended to be a points-judged gold show car. The results were stun­ning. While that level of effort may be more than you need, keep in mind that a quality paint job needs as perfect a surface as possible. Any imperfections will show through the paint. Lighter colors may hide minor imperfections at a casual glance; darker colors hide nothing black demands perfection. To paint at home does require some serious equipment. First you’re are going to need a powerful air com­pressor with a large tank. A small 2-hp single stage compressor with a 10-gallon tank will not provide the required 25 to 50 psi over a long enough period of time to paint a car body. Therefore, you need a large twin-stage 3 hp or larger compressor with a 50 to 60 gallon tank. These typically retail for $700 on up. Now you’re going to need the requisite air hoses and a regulator to ensure you are maintaining consis­tent air pressure. A couple decent air hoses will cost you about $100, and you will have to buy a spray gun. Pros often use one gun for primer and another gun for paint. While you can use the one gun for both, you need to always thoroughly clean the gun. Inexpensive guns that pro­vide an adequate paint spread retail for $100. However, the high-quality paint guns DeVilbiss, Sata, and oth­ers retail for $300 to $600. While we can’t cover every single aspect of spraying your car, we will provide some of the basics. The paint manufacturer provides specific air pressure levels for the cer­tain amount of paint, so follow those instructions to obtain the best results. You need to set your air compressor to deliver 25 to 50 psi when the spray gun is activated. Most regulators are set at about 30 psi, and this trans­lates into about 25 psi at the gun. You need to practice against paper before you start spraying any primer or paint. On the spray gun itself, you will find a knob to adjust the paint spread or pattern, and another knob adjusts the thickness or the amount of paint traveling through the gun. 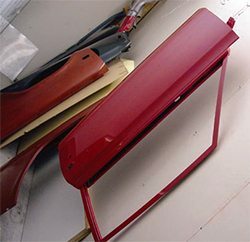 The gun should deposit most of the paint in the middle of the applica­tion area and less towards the edges. Point the gun at a piece of masking paper, and pull the trigger a bit fur­ther to allow fluid. To mask off the sensitive parts on the car takes the right materials and attention to detail. A thorough and complete masking job of an entire car often takes a full 8 hours. Masking paper is available in several widths, but many body workers opt to use 3-foot-wide rolls, which are ideal for cover­ing glass, trim, and other parts. These rolls come in 1,000-foot lengths. The tape needs to follow the curves of the trim and glass, and you must make sure that the tape extends to the edge of the trim. You can use an X-acto or razor blade to make precise cuts of the masking paper to precisely fit the particular part being masked. If the paper or the tape extends to metal body work, you have to repaint that particular area. On the other hand, if paint bleeds through a gap in the tape, you have to remove the paint from glass or trim, which is far easier. Remember, the chassis, suspen­sion, and all other parts are exposed to overspray. Mask in paper that extends from the chassis to the floor, so no overspray gets under the car and ruins the finish of any component. Some classic muscle cars demand original paint to maintain authentic­ity and acceptance within the com­munity. The GTO community and popular GTO shows accept a wide variety of paint finishes on owner cars. There are a number of paints available today. Acrylic lacquer, acrylic enamel, urethane, and now water-based paints are options. Each type has defi­nite benefits and drawbacks. Lacquer is the easiest to apply and touch up, but it is also the least durable. 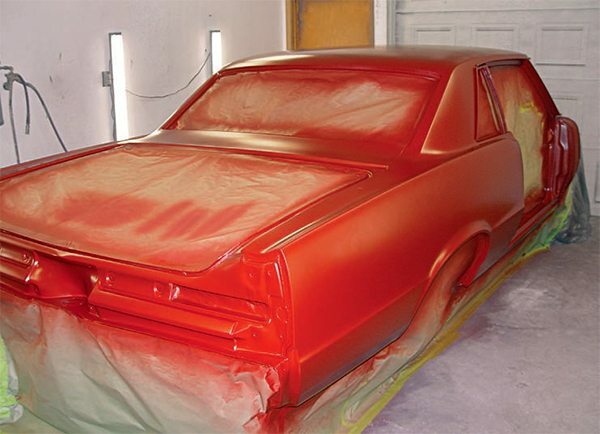 Few GTO owners select laquer because the new urethane paints provide far better durability. Acrylic enamel is very durable but it is more difficult to apply than lacquer. Urethane paint is one of the most durable and for all intents and purposes has replaced the acrylic paints. But like acrylic enamel, it is difficult to spray when compared to lacquer. Once you and your painter are sat­isfied with the filler and sanding por­tions of the job, it is time to apply the primer. The final primer coats should be applied at a body shop in a paint booth and block sanded between each coat. How much sanding varies, but the price and the amount of prep between coats is a topic for you and the shop manager to work out. It is likely that the shop has a set schedule of procedures and costs. You may be able to work something out with the manager where you can do the block sanding between coats to save some money it never hurts to ask if you are so inclined. Level of preparation and division of labor (block sanding of primer, etc. ), if any. Inspection of paint between coats (make sure that the prob­lems are solved before moving to the next coat). In this era of spectrometer color sampling and computer-aided mix­ing, the chances for variations in color have been greatly reduced. However, common sense still applies and mixing up a suitable amount of paint for the job is still a prior­ity. Today, fortunately, it is easier to match colors between two different batches, should something go wrong. Depending on the paint system, you may have the option to color sand your paint job between coats. If you can, this is a great opportunity to fix any imperfections, which end up showing through and reducing the quality of the restoration. Dust, runs, sags, orange peel, and other problems can be corrected at this point. One of the great qualities of catalyzed enamels is that once they are dry, they are very hard, very dura­ble, and their hardness goes through its entire thickness. This allows for color sanding, which accomplishes two things. Number one, it provides a suitable surface for the next coat to adhere to. Number two, it allows the painter to remove the aforemen­tioned imperfections. So, if the painter gets a little heavy-handed with the paint gun and the paint runs a little or a bug inadvertently gets into the spray booth, lands on a fender, and gets stuck, all is not lost. With some careful wet sanding and subsequent cleaning of the surface, you are ready for another color coat. (Eventually, your clear coat will be applied, if that is part of the paint system you choose.) When the top coat is sprayed, whether a clear or color coat, it also undergoes the same sort of prep as the color coats except that there are more steps in the sanding procedure. The top-coat sanding starts with a 1,500-grit paper, moving up to 2,000- grit. To the naked eye, sandpaper this fine doesn’t look much different, but it polishes the paint to a point where it can then be buffed and waxed. If you are planning to have painted pinstripes, add them after the top color coat but before the first clear coat. If you aren’t using clear, add them after color sanding but before polishing. If you have a GTO Judge or any GTO with tape stripes, graphics, or decals, add them after all polishing has been done but before final wax­ing. Be sure to remove all polishes and compounds from the areas where the decals are applied. Fortunately, reproduction stripes and decals are available for just about any combina­tion of GTO made and the quality is very good. Using NOS stripes, if you could even find them, would probably not be a great idea. With 40-plus years since they were made, they are most likely discolored and the glue has lost its adhesion qualities. Reproductions are available from a variety of sources, such as Phoenix Graphix and Sten­cils and Stripes Unlimited, as well as larger restoration parts houses. If you’ve done your homework, the finished product, whether driver-quality or concours-ready, will be an exhilarating thing to behold! 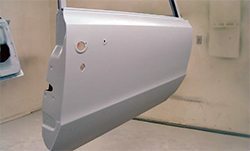 As with the priming phase of the operation, spray base coats and the clear coats on the bolt-on sheet metal, which is separated from the main body, ensuring superior results. You can use PPG Deltron for the base coat and DCU 2002 for the clear. Though it looks beautiful and shiny, there’s quite a bit of sanding and polishing yet to do. Apply the clear coat and then start color-sanding. It is recommended not to sand between color coats because it can hurt the luster of metallic finishes. Non-metallics can be sanded, but only if there is an imperfection that needs to be repaired. Color sanding is often only done on the clear coat.